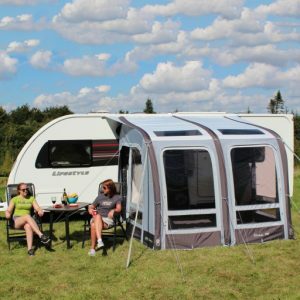 Brand new for 2018, the Outdoor Revolution Elise 260 is a luxurious caravan awning which allows you extend the space of your caravan, by providing the perfect outdoor shelter you need. The light coloured fabric gives the modern look and feel, whilst letting plenty of light in to make it feel less enclosed. 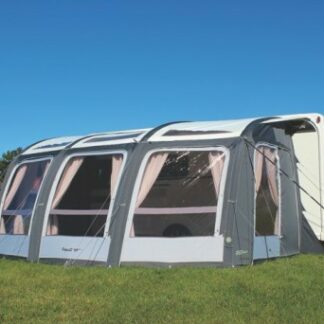 The 280cm depth of the Elise range is perfectly compatible on all camping and caravan club pitches, both in the UK and abroad. Perfect for mini-breaks or weekends away; the Elise 260; is durable, versatile and boasts many outstanding features, including Outdoor Revolutions’ 600 High-Density Oxford Weave fabric. 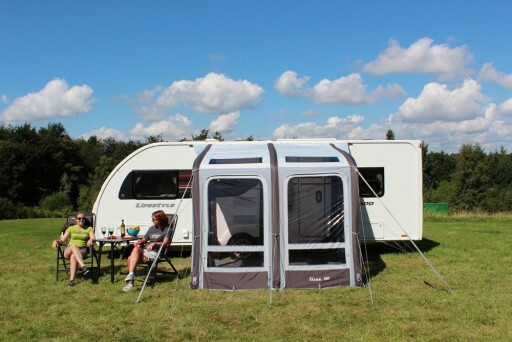 The specially crafted material has the optimum strength to weight ratio out of any awning fabric, which makes the material is exceptionally strong and hard-wearing. All the while maintaining the signature lightweight properties of a porch awning. With Outdoor Revolution, they incorporate their Oxygen Air-Frame technology in all their air products and the Elise is no different. The main difference between the beams in this awning and any other awning is that it incorporates the Dynamic Speed Valve and the patented Intelligent Frame Relief Valve. This relief valve is there to prevent damage to the tube by expelling excess air, usually caused by an increase in ambient temperature. 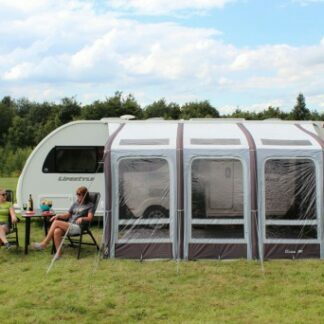 It inflates quickly using their Dual-Action Pump provided with the awning and with it’s separate tube system it will be up in no time. The versatile front doors can be fully zipped back, or alternatively zipped halfway and folded down like a barn door. This creates additional flexibility to the awning, as it can be fully opened up and used as a canopy in hotter weather. 600HD Polyester – A Quality Traditional-Feel Fabric, Utilising All of the Benefits of our Signature Lightweight Fabrics. NEW Patterned Roof Fabric – To Add a More Stylish & Contemporary Touch. Three Main Oxygen Air-Frame Tubes – Multiple Inflation Point Air Beams. Four Roof Support Air-Frame Tubes – For Maximum Stability of the Awning During Poorer Weather Conditions. Dynamic Speed Valves – The Quickest & Most Reliable Inflation Valve on the Market. Intelligent Frame Relief Valve Protection System – Our Patented Pressure Relief Valves, Expelling Any Excess Air Above 5 PSI. Tinted Windows – For Increased Privacy & Reduced Glare. Embossed Zip-In Curtains – Pattern-Embossed Curtains for Further Privacy & To Make It Feel More Like Home. Phoenix Mesh. Doors – Created from a Assisted-Healing ‘Smart’ Material, Repairing ‘Snag’ Damage Caused Over Time. Lumi-Link & Up/Down Lighter Compatible – To Offer the Option of Brightening Up the Awning During Darker Periods. PVC Draught Exclusion – To Maintain a Comfortably Warm Temperature Inside the Awning. PVC Draught Skirt – To Maintain a Comfortably Warm Temperature Inside the Awning. Two Endurance Storm Straps – To Provide Optimum Stability & Posture During Harsher Weather and Storms. Includes Pegs, Dual-Action Hand Pump, Guylines, Repair Kit & Lumi-Link/Lumi-Lite Attachment Points.